1/126 Kim Hollis The very definition of a Wes Anderson film. Quirky, funny, sad and consistently creative. 10/55 Reagen Sulewski Lesser Anderson, but still well above most with delightful randomness that comes together coherently in the end. Like a film written by a 12-year old and translated from another language. 24/48 Les Winan Were it not for the outstanding work by Bill Murray and the unfailing Cate Blanchett, even more would be lacking from this disappointing film. In his short career, screenwriter/director Wes Anderson has established himself as one of the quirkiest in the business, but it's really his attention to detail that sets him far apart from the pack. Up until now, Anderson has directed three films, all of them co-written with Owen Wilson. The pair started with the goofy but brilliant caper film Bottle Rocket, which producer James L. Brooks financed. It was a bust at the box office, but opened the door for bigger and better things. Next came Rushmore, which was another financially slight but critically acclaimed picture that starred Bill Murray and introduced Coppola family member Jason Schwartzman to an appreciative audience. It's worth noting that both Rushmore and Bottle Rocket were on BOP's Top 50 Underappreciated Recent Films list; Rushmore was our number ten selection, while Bottle Rocket placed even higher at number five. Then came the film that won BOP's Calvin Award for Best Picture of 2002, The Royal Tenenbaums. This outstanding story of a highly dysfunctional family is simply a brilliant film, with incredible acting performances all around and an idiosyncratic sense of humor that is somewhat difficult to explain. That film was far more financially successful than any of the previous Anderson/Wilson collaborations; it made $52 million in theaters, but even more impressively, it took in nearly $90 million in rental receipts, making it one of the biggest video hits ever. Now, Anderson is back for another go-round, this time without the writing assistance of Wilson. Anderson co-wrote The Life Aquatic With Steve Zissou with the little-known Noah Baumbach, but Wilson will still be on hand as the film's co-star. Wilson will play Ned Plimpton, the estranged son of a famous French oceanographer named Steve Zissou, who will be played by none other than the guy who was robbed of an Academy Award for Lost in Translation (and Rushmore), Bill Murray. 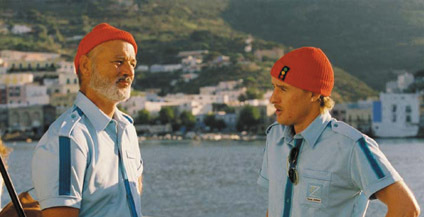 Loosely based on the life of Jacques Cousteau, The Life Aquatic With Steve Zissou will be a combination of live action and stop-motion animation. The animated portion of the film will be used to highlight and illustrate the undersea world, and is being done entirely by Henry Selick, who directed James and the Giant Peach and The Nightmare Before Christmas (we're nowhere near ready to forgive him for Monkeybone, though). As with all of Anderson's comedies, this film will rely heavily on the ensemble. Like The Royal Tenenbaums, it's looking to be a very solid cast. In addition to Murray and Wilson, the troupe includes Cate Blanchett, Tenenbaums' Anjelica Huston, Willem Dafoe, Michael Gambon (Dumbledore in Harry Potter and the Prisoner of Azkaban), Jeff Goldblum, Seu Jorge (City of God), and Noah Taylor (Almost Famous).